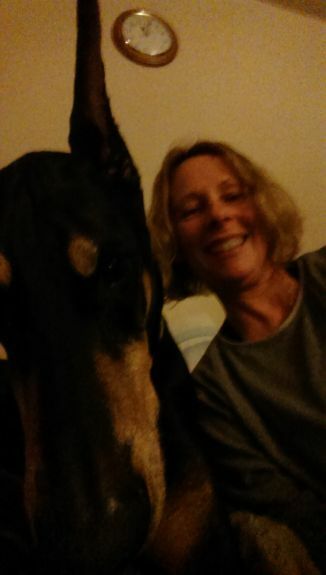 I was chatting with a Tripawd friend tonight and she said I needed pictures of the two of us for memories…..for some reason I hadn’t done this yet, so I thought I better start. Nitro continues to do well; we’ve reached the 10 1/2 month post amp mark, and he continues to amaze me daily with his joyful acceptance of his new life. Yesterday he was frolicking in the yard with his Westie brother Kodi exactly like he used to….I think he is excited for Spring to finally make an appearance in Wisconsin. This entry was posted on Monday, April 6th, 2015 at 5:08 am	and is filed under Uncategorized. You can follow any responses to this entry through the RSS 2.0 feed. You can skip to the end and leave a response. Pinging is currently not allowed. And a beautiful memory it is! A whole lot of love in this photo! 10 1/2 MONTH AMPUVERSARY!!!!! Waaaay to go Nitro! Such an inspiration!! Seeing Nitro enjoy life with Kodi has to make you grin ear to ear! And seeing Spring come makes everybody feel better!! Keel these pictures coming! We LOVE pictures AND videos around here!! Ice cream and cake to celebrate continuing milestones for Nitro! Way to go Nitro on your 10 1/2 month Ampuversary!! You’re doing AWESOME!!! And I wish I had thought to have some pics taken with me and Leland. I was always the one behind the camera trying to get pictures…and hubby used to pick on me about all the pics I would take. I wish I had taken more. With Lucian though I’m snapping pictures ALL the time. And I’ve gotten a few “selfies” with him with my cell phone (since I recently upgraded from a flip phone..lol). That’s a great picture and memory of you and Nitro. Keep them coming! Oh that is TOO cute! OK my question is, did Nitro take the photo? Cause otherwise you have some very long arms!!! We need more of these. Just adorable. I DO have long arms!